A meteor is what you see when a space rock falls to Earth. It is often known as a shooting star or falling star and can be a bright light in the night sky, though most are faint. A few survive long enough to hit the ground. That is called a meteorite, and a large one sometimes leaves a hole in the ground called a crater. A rock that has not yet hit the atmosphere is called a "meteoroid". Meteoroids may range in size from large pieces of rock to tiny dust particles floating in space that did not form planets. When the meteoroids enter Earth's atmosphere they are usually going faster than the Earth's escape velocity of 13 km/sec or Mach 40. This makes them heat up and usually break apart. When the heat makes them glow, they are known as meteors. Meteors are distinct from comets or asteroids, but some, especially those associated with meteor showers, are dust particles that came out of comets. There are several types of meteorites including: stony, carbonaceous chondrites, and iron-nickel. Stony meteorites are named because they are largely made up of stone-like mineral material. Carbonaceous chondrites have a high carbon content. Iron-nickel meteorites are mostly iron often with significant nickel as well. Chondrites are stony (non-metallic) meteorites that are as old as the Solar System: 4.55 billion years. They sometimes contain amino acids and other organic molecules. They have not been modified due to melting or other disturbances. They are formed when various types of dust and small grains that were present in the early solar system accreted to form primitive asteroids. They are the most common type of meteorite that falls to Earth: they are about 85 or 86 per cent of all meteorites. Their study gives clues about the origin and age of the Solar System, the synthesis of organic compounds, the origin of life or the presence of water on Earth. Chondrites can be differentiated from iron meteorites by their low iron and nickel content. About 8 percent of meteorites show signs of melting and recrystallising. They look rather like basalt or granite. 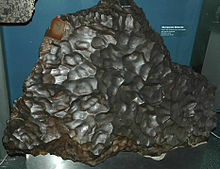 Iron meteorites are meteorites made of an iron–nickel alloy. They are about 6 per cent of all meteorites. This comes from the inner cores of early small proto-planets. The iron found in iron meteorites was one of the earliest sources of usable iron, before humans invented smelting. That signalled the beginning of the iron age. Iron meteorites are easily found, because native iron is rare. Siderolites are stony-iron meteorites that have almost equal parts of iron and silicates. They are quite rare: only about 1 per cent of all meteorites are siderolites. ↑ The use of the term non-metallic does not imply the total absence of metals. ↑ Bischoff, A.; Geiger, T. (1995). "Meteorites for the Sahara: find locations, shock classification, degree of weathering and pairing". Meteoritics 30 (1): 113–122. doi:10.1111/j.1945-5100.1995.tb01219.x. ISSN 0026-1114. This page was last changed on 23 May 2018, at 00:52.